Photo taken along the streets of Antigua, Guatemala last Saturday. Antigua, the old capital of Guatemala and a UNESCO World Heritage Site is a photographer’s dream. Every street you turn is yet another picturesque setting. You can spend an hour just taking photos of a single building! I would have done it if I had more time, believe me. 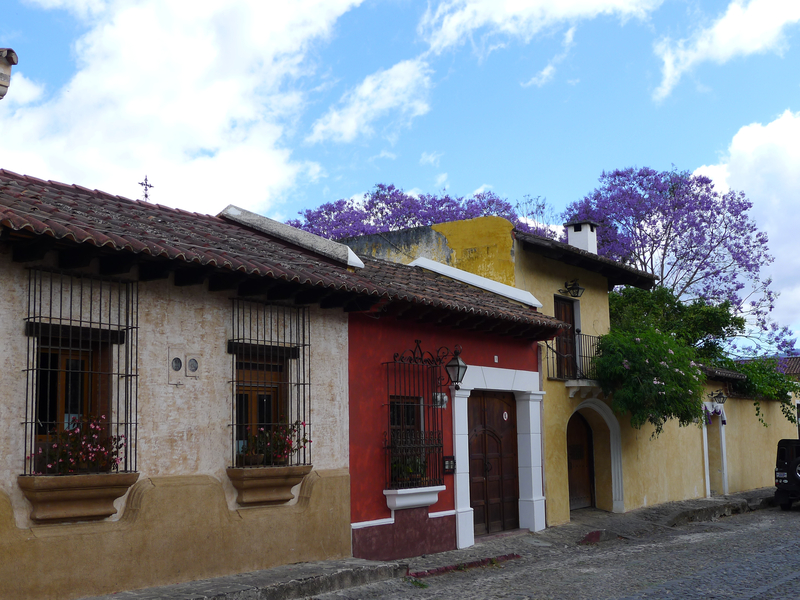 I love this photo above of the typical homes and buildings down the streets of Antigua. The colors are delightful and can cheer anyone on a cloudy day. Apparently there are rules and regulations on which colors the buildings can be repainted and the entire city has been majestically restored since the last earthquakes which forced the relocation of the capital to Guatemala City hundreds of years ago. I took at least 400 pictures in one day in Antigua! Stay tuned….more coming here and on thirdeyemom.com. Nicole, I love this photo and I’m so happy you fell in love with Antigua! If you visit again there’s still so much more to see!